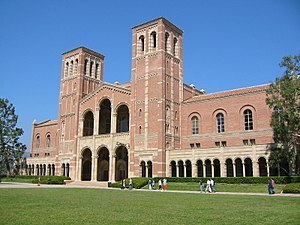 Royce Hall, University of California, Los Angeles. Friday Morning Club Building, Downtown Los Angeles, (Julius Schulman, photographer). First Baptist Church of Los Angeles. Janss Investment Company Building−Janss Dome, Westwood Village. Allison & Allison was the architectural firm of James Edward Allison (1870-1955) and his brother David Clark Allison (1881-1962). Originally based in Pittsburgh, Pennsylvania, in 1910 the Allisons moved to Los Angeles in Southern California. At first they specialized in public schools. Riverview United Presbyterian Church, Pittsburgh, (1907). J George Becht Hall, Clarion University, Clarion, PA (1907). Friday Morning Club Building, Downtown Los Angeles, (present day Variety Arts Center), Downtown Los Angeles (1923). Wilshire United Methodist Church, with Moorish Revival 'La Giralda Tower' (1924). First Baptist Church of Los Angeles, Westmoreland and 8th Street, Los Angeles (1925). Western Pacific Building, South Broadway, Downtown Los Angeles (1925). Thirteenth Church of Christ Scientist, (1926). The Janss Dome—Janss Investment Company Building, Westwood Village, (1929). First Congregational Church, Commonwealth and 6th Street, Los Angeles, (1932). Kerckhoff Hall, UCLA campus (1930). Beverly Hills Post Office, Beverly Hills, California, with Ralph Flewelling (1932-1933). Kaufman Hall, UCLA campus (1932). Robinson's Department Store, Downtown Los Angeles flagship store, modernization of street facades with Edward Mayberry (1937). Hollywood Post Office (Hollywood Station) in Hollywood, with Claud Beelman & WPA artists (1937). ^ You-are-here.com: Allison & Allison, selected projects . accessed 21 June 2015. ^ "Building on the past: Westwoods history can still be seen in the architecture of the Villages newer businesses". Retrieved 2014-02-14. Wikimedia Commons has media related to Allison & Allison.